Diese Seite erscheint in englischer Sprache, da sie von meiner ursprünglichen Webseite kopiert wurde. Eine deutsche Version ist in Arbeit. What is special about Niue? after sunset its like someone switches the ionosphere! You suddenly have signals on all bands, and you hardly can decide which one to use this time. and stations told us afterwards that we had a good signal. But thats not all about Niue. If you are interested, I have some details listed below, maybe your next holiday will be there!? 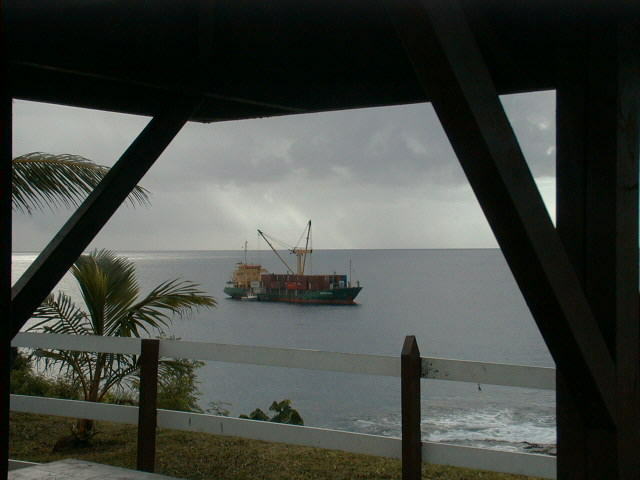 Niue is situated in the southern hemisphere, on 19 deg. south and 168 deg. west, nearby the international date line. How can I reach Niue? If you`re coming via Sydney, you can book tickets from Auckland to Tonga and then to Niue; if you`re coming from North or South America, you`re probably coming via Honolulu, Fiji, and Tonga to Niue. What`s so special about Niue? The nickname of Niue tells it all: "The Rock of Polynesia". Niue was a coral reef in ancient times, and due to earthquakes it has risen above the Pacific. Its highest point is about 70m above the ocean. It is near the Tonga rift, and it`s very separated from any other islands or the mainland. You can even watch whales on their way passing Niue, and there are many fish to view when snorkelling or diving. What`s accomodation like on Niue? What if I get sick staying on Niue? Normally that should not be a problem. There is no malaria, and any sorts of fevers haven`t been recognized since several years. In the case you really get ill, there is a good hospital in the capital Alofi. They will do their best to help you. If they can`t, you will probably be flown out to New Zealand, depending on how bad the illness is. What are prizes like on Niue? As mentioned before, Niue is a very separated island, so only few people live there. There is a container ship coming regularly and carrying all the goods necessary for life, including food and, of course, beer! For example, a can of beer (0.375 litres) is available for 2 NZ-$, and a bread also costs 2 NZ-$. It`s expensive, you might say, but remember, that all that is coming via the ocean, except the bread and some sorts of fruit. where to snorkel and where not, and much more. There`s a guest book which you can fill in, if you like. The island is about 70% covered by a natural rain forest, and there are ways through the forest. Almost everything grows there, because it`s very humid and warm there. During our visit on Niue (March/April 1999) we had one single day below 30 degrees celsius, on all the other days the temperatures were higher. 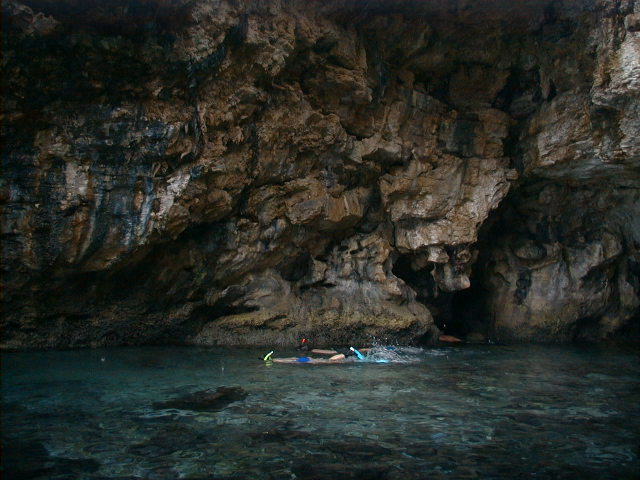 One of the caves where snorkeling is a MUST! Shopping with a bike starting at Namukulu, going to Alofi is very exhausting because of the high temperatures and the humidity, but after some days you are getting used to it. 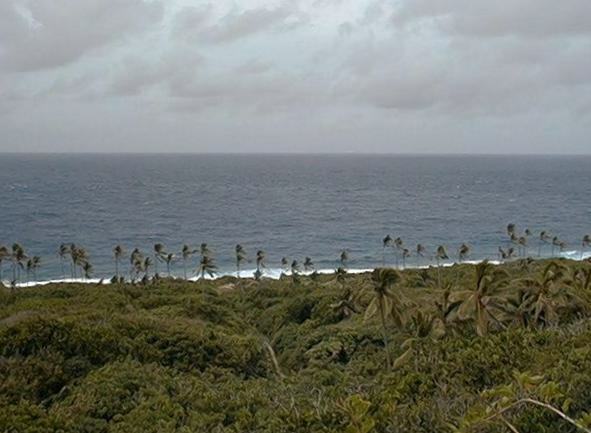 Namukulu is about 10km north of Alofi, directly at the steep coast of Niue. If you don`t want to "bike the Rock", you can also rent cars from local car rentals in Alofi, and visit the east coast of Niue; there are also some famous places to visit, although only few people live there. A guest licence for Ham Radio operation is available from Telecom Niue. It is prized very low (20 NZ-$, in 1999), and if you contact them before your trip, you can probably get your desired callsign with the licence sheet on the day of your arrival! All other information can be obtained either from the Niue Homepage, or from Niue Tourism Office. People are very helpful and friendly there, like all people on Niue. You can contact numerous different hotels and motels, either via their own E-Mail adress, or via the tourism office. They can also tell you the present price tables for these different accomodations. 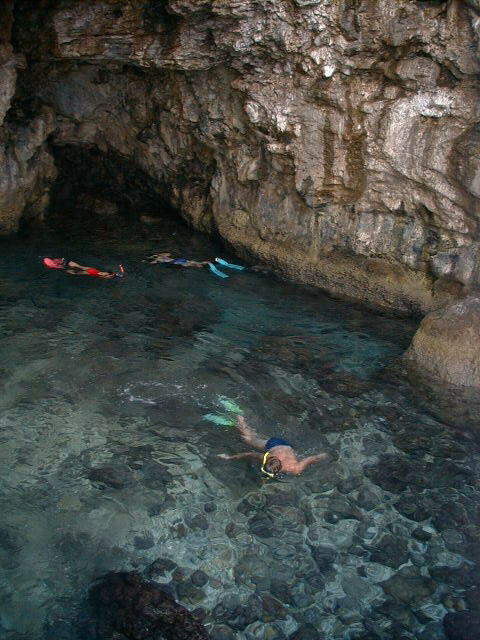 You should consider to visit Niue, it`s worth time and money!